When you have a baby, there is so much that you need. Your diaper bag needs to have all the essentials that you might need when you're away from home. In addition to needing an extra outfit (or two) and diapers, there are many other items that your diaper bag simply must have inside. The Diaper Bag Buddy is a wonderful diaper bag sized, baby basics kit filled with must-have items for mom and baby. Each item is tucked neatly inside a re-useable plastic container that fits perfectly inside your diaper bag or vehicle glove box. This giveaway will end July 26th at Midnight EST. Disclaimer: I received a complimentary Diaper Bag Buddy from Me4Kidz for the purpose of writing a review and hosting a giveaway. Regardless, I only recommend products or services I use personally and/or believe will be a good fit for my readers. The views and opinions expressed on this blog are purely my own. Results may vary. No monetary compensation was received. I would like to have the medi buddy first aid kit to go. I would like the nail buddy. I'd like to have the Medibag.They have so many cool things.Thanks for the giveaway! The Medibag would be great to have! The Medibag Family First Aid Kit - and I like that you can purchase refills. 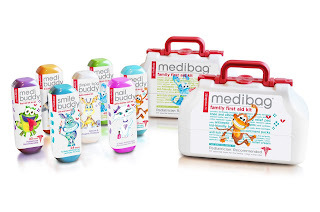 the medi buddy first aid kit to go. I would love to have the Medi Buddy. I would like to have the Nail Buddy kit. Thanks for such a cool giveaway! I would also love to have the smile buddy! I also like their Family First Aid Kit! I'll be sure to share this article, I'm sure that a lot of people will love this.